If you’re looking for the perfect side dish, appetizer, or delicious snack to munch on over the holidays, these Sweet & Salty Oven Roasted Chickpeas are IT! Drain the can of chickpeas and wash thoroughly. Set aside to dry completely or spread them out on a towel and lightly dry using a paper towel (be careful not to smash them). Once dry, place all the chickpeas in a small mixing bowl. Add all the remaining ingredients above and toss well to completely coat the chickpeas. Arrange the seasoned chickpeas in a single layer on the lined baking sheet. Once the oven is to temperature, bake the chickpeas for about 20 minutes. Remove from the oven and slowly mix. If needed, season once more with salt and/or maple syrup, tossing to combine (note, I did not need any extra flavor after baking). Serve hot or at room temperature. Store the leftovers in the fridge. Enjoy them as a snack or side, or layer them on top of some avocado toast! 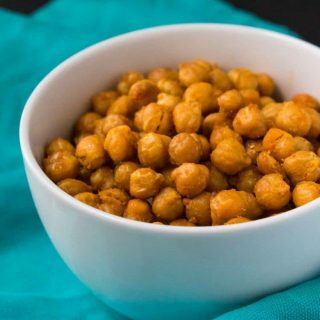 These chickpeas are best served hot, but they also taste great cooled to room temperature. They can be served as a side, snack, or appetizer.